Upload and check your documents within seconds. With our comprehensive report you will easily identify the amount of potential plagiarism and matched content in your documents. If you wish to download your report locally or share it online, you can do so directly as well! For the curious ones, there are also additional settings enabling you to accomodate and customize your workflow. Do not spend hours checking content manually, when you can do that effectively with PlagScan! 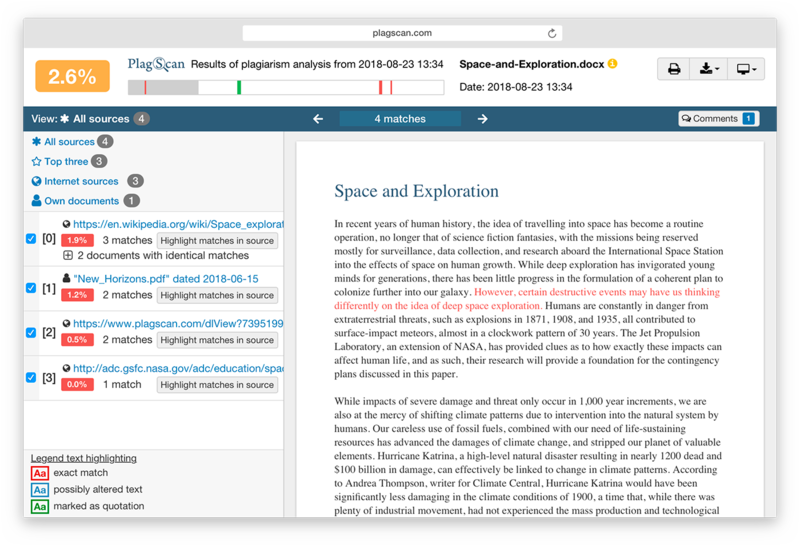 Plagiarized text, potential plagiarism and citations are directly highlighted in the text. Sources are clearly displayed and accessible. The percentage of your text found in other sources is available. Upload the document you wish to check from your computer, the cloud or by copying and pasting it.The original formatting will be kept. Your document won't be shared with anyone. Once you get your report, you can download it in different formats to keep a copy locally. Over 1.500 institutions and 1 million people use PlagScan! Studying takes a lot of my time. I’m so happy I found an accurate software that shows potential plagiarism in detail reports. It saves me so much time! 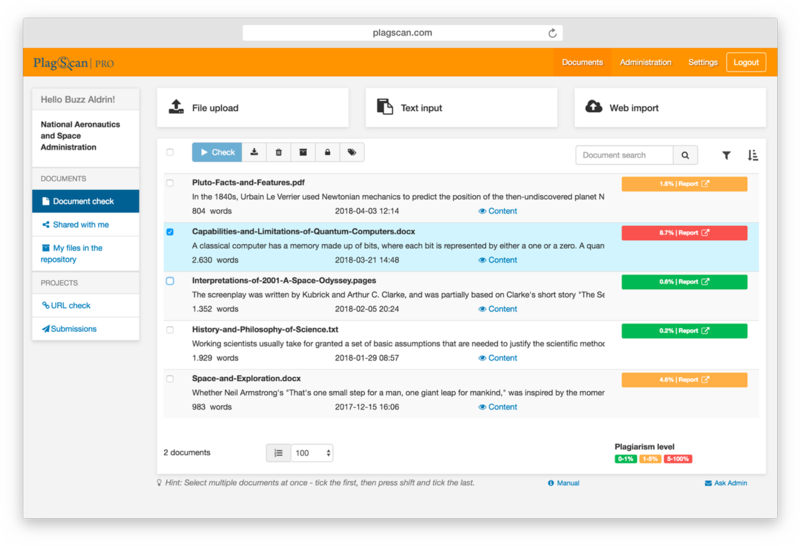 Among the three plagiarism scanners I have used, PlagScan works best. I use it for all research publications I submit or review. In case of issues, you get answers within hours instead of days. Highly recommended! Always stay in full control. No one else has access to your documents. Efficient duplicate analysis and clear report - plagiarism highlighted in the document. Easy upload from Dropbox, Google Drive, OneDrive or your desktop. No subscriptions, pay on demand with our easy prepaid system. PlagScan integrates into your workflow. Our cloud system can be integrated into any LMS or CMS. Administrators can create and manage organizational repositories. Plagiarism reports can be shared with your colleagues or students. We are always happy to discuss tailored agreements when needed. It seems you really like our service. Get more free scans by registering now! Do you have a paper you want to present at your school or university, but you are not sure how original it is? Are you are a business owner and want to make sure the content on your website is free of plagiarism? Are you about to apply for a job and want to have a unique motivation letter? Share it directly with your peers, professors or employees! Check out our sample report that contains an already checked document and discover what you can expect from our plagiarism checker! What to do if the percentage of plagiarism is high? If you get a high percentage of plagiarism or “PlagLevel”, how we infamously call it – do not despair! Our software calculates an estimate of how much content within your document has been plagiarized and generates a full report based on that. After the plagiarism analysis, you are advised to use this information to your advantage. You are free to rewrite the sections in your document that have been marked down or you can cite them properly, if you have borrowed them from another source. After that, you can rerun the check on the revised document, to confirm your plagiarism percentage dropped!